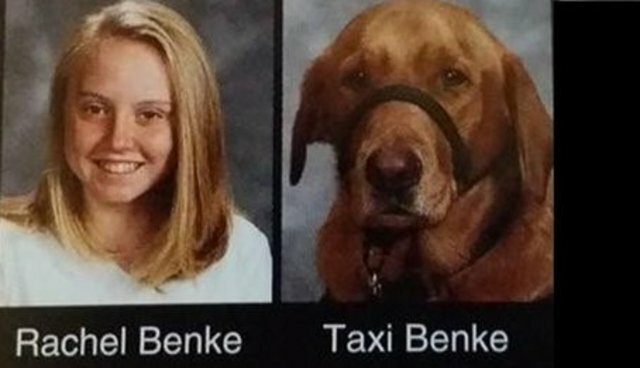 For the last four years, 7th-grader Rachel Benke and her devoted service dog Taxi have been inseparable companions -- so much so, in fact, that now their special bond will be preserved for perpetuity in her junior high school yearbook. Rachel, who has suffered from epilepsy since she was a baby, goes everywhere with the sweet golden retriever-lab mix, but he's much more than just a pet. Taxi has a remarkable ability to detect when a seizure will strike, giving Rachel crucial time to get medical attention. Before the service dog came into her life, Rachel's mother Theresa tells KENS 5 News, she'd shown little improvement in her condition and had even been fearful of animals, but that all changed the moment she met Taxi. "Next thing you know Rachel just hugged him and it was the cutest thing you've ever seen and I literally started crying and said there's my sign. They've been a team ever since," says Theresa.